This briefing is to inform all CPs that we'll be carrying out a Proof of Concept from 20 October 2017 to apply XdB to a subset of GEA-FTTC ECI lines. So we've heard nothing further about retransmission on ECI FTTC, but now Openreach have announced when an XdB SNRM test will start. Nice.. wouldn't this need g.inp to work properly ? It will be interesting to see how kitz' and Chrysalis' circuits behave with a lower target SNRM. Haha, this is amusing, I wonder how many lines would possibly support this without G.INP. Not many I imagine, mine in its current state certainly wouldn't. Proof of concept is an interesting phrase to use, to me that implies perhaps a trial or partial roll out rather than full roll out for all? Why didnt they use the word trial? I wonder how many lines would possibly support this without G.INP. Not many I imagine, mine in its current state certainly wouldn't. Theoretically mine should. Its run perfectly fine in the past for for several weeks at 3dB after resyncing before my crosstalker(s) without it causing an increase in the error rate. What currently upsets the apple cart on my line is the morning blip of errors that sometimes gets stuck until I perform a manual resync. If I don't catch it quick enough DLM spots it. 3dB should take my line back up to near 80Mbps sync. If it wasn't for that daily blip I'd be fine. I ran at 3dB for many years on BE* without issue. If DLM was working how it should then, it should back off back to 4db > 5dB > 6dB. However they did a botch job of capping after ASSIA, which doesnt appear to like backing down again even if the line is stable. The DLM process needs a total review on the steps it takes, the original NGA process seemed to work OKish. The botch job on NGA after ASSIA and a a further botch for G.INP has complicated things. As Ive said before, unfortunately I dont see them doing any review whilst the 2 [cab type] systems have different processes. The main difference with the NGA system process is that it uses capping to a much greater extent than the 20/21CN systems. It is clear from the court case documentation that ASSIA's main complaint was with the NGA DLM and reading between the lines there was suggestion that it may be with the ILQ, which in turn infers how it returns back to normal. If they ever get G.INP on ECI and they do start using 3dB, then IMHO it would be best if they abandoned capping and returned to the tried and trusted target SNRM which works fine on 21CN. 3dB also works fine for many lines on 21CN, the mess with NGA is that lines get stuck with a cap far too easily. I think "proof of concept" comes before a trial or deployment. mine wont do anything given I am already at the cap set for my line (thankfully). If this is rolled out without g.inp I can see it been a bit messy. Some users of Openreach’s (BT) ‘up to’ 80Mbps capable Fibre-to-the-Cabinet (FTTC / VDSL2) broadband lines, specifically those stuck on troublesome ECI based street cabinets, may soon benefit from a speed boost when OR attempt to adopt a default target downstream noise margin of 3dB. The SNR (Signal to Noise Ratio) of a standard VDSL2 or ADSL based broadband line (most consumers in the UK have one of these two) reflects the balance (measured in decibels) between the useful information coming down a line (good signal) and unwanted interference (bad signal / noise). 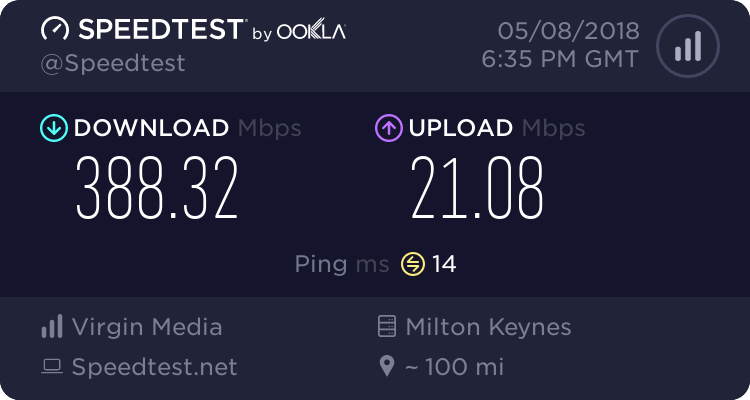 The default target downstream (download speed) noise margin on Openreach’s VDSL2 (FTTC) lines was previously set at 6dB, but by dropping this to 3dB you could deliver a free speed boost to stable copper lines (especially very short ones). Speed increases of up to 9Mbps have been spotted on some shorter lines, although not all lines will benefit. The desirable outcome for BT is that they get both G.INP and XdB working. This might be a way to overlap the two trials, and fastrack that outcome. I could envisage an XdB PoC going on in parallel with a G.INP trial, with lines qualifying for XdB only after proving to behave on G.INP. In all honesty I think you really mean ECI . . . Topics merged to give ejs credit as original author and person who disclosed this info. I'm aware Mark follows (no prob with that), but no further info in that which hasnt already been covered on here. Thanks Bowden, as you may not have been aware this was previously under discussion.